Prado, Madrid Hieronymous Bosch mocks ignorance and the trickery of sick people in his picture Curing Folly, which he painted around 1485. It belongs to a type of intentionally satirical paintings and engravings that were common in the Low countrys at the time. A legend written in Ghotic letters says: "Master cuts out the stone - my name is Lubert Das"; the name here apparently meaning 'little gelded man', which also has the sense of 'simpleton' in Flanders. The operation is being performed before a small audience. 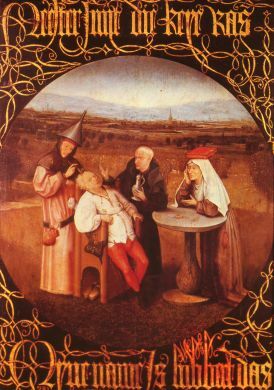 The quack doctor, crowned with a funnel, removes the stone from a fat, old man who gazes at us. A friar seems to sketch a blessing, while an old woman, who is balancing a book on her head, stars at the farce in bored contempt.